Many patients prefer porcelain veneers as an alternative to dental crowns. If you are considering one or the other, Dr. Prasad Gonavarum will advise you accordingly at your initial consultation. As with dental crowns, two appointments are necessary to ensure the proper fit and placement of your new porcelain veneers. 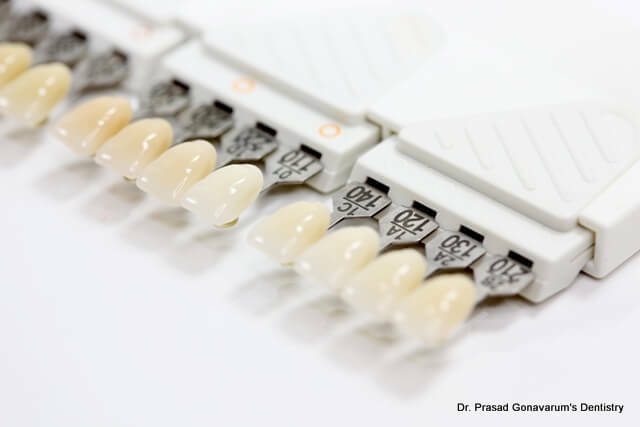 At the first appointment, Dr. Prasad lightly buffs and shapes the surface area of the teeth to ensure the proper thickness to place the porcelain veneer. You may request anesthesia for this procedure if you prefer. He also takes an impression of your mouth and selects a shade for your new veneer based on the color of your other teeth. When you return for your second visit, Dr. Prasad first etches and cleans the teeth. Next, he places bonding cement on the teeth receiving veneers and uses a special LED light to create a strong adhesive. Lastly, he places your customized porcelain veneers onto your teeth and makes sure they are firmly in place. Before you leave the office of Smiles of Naperville the staff provides you with detailed care instructions to ensure that your procedure lasts as long as possible. To know more about veneers, Call Smiles of Naperville today or convenient online scheduling.